OmG, the world of today is full of abbreviations and emojis. But talking about this would be off-topic. So today I’d like to talk about W ireless C harging of eLoot. particularly the smartphone flagships of the two big rivals. Apple will reportedly get it. And both wouldn’t have it without the groundbreaking publication of “A Dynamical Theory of the Electromagnetic Field” in 1865, by Scottish J.C. Maxwell. So much for copycats. Induction chargers use an induction coil to create an alternating electromagnetic field, and a second induction coil in the portable device takes energy from the electromagnetic field and converts it back into electric current to charge the battery. The source field must cover the receiving coil which results in a very short range of energy transfer. Device and charger must be in close contact. Over greater distances this method is highly inefficient and wastes the vast majority of the energy. A tuning fork can cause another to vibrate when both are tuned to the same pitch. Using the resonance phenomenon energy transfer can drastically be increased and wouldn’t require a close contact between the charger and your device. You still need a cable to connect your charger to a power outlet. It’s uncomfortable to use the device without taking it off. Charging is immediately stopped. It’s less efficient. Charging time increases. It’s comfortable to just put it on the WC. It’s bigger than a traditional charger. It can charge lots of different devices following the Qi standard (One-For-All). Apple, does your approach to wireless charging of iPhones include something new and exciting? 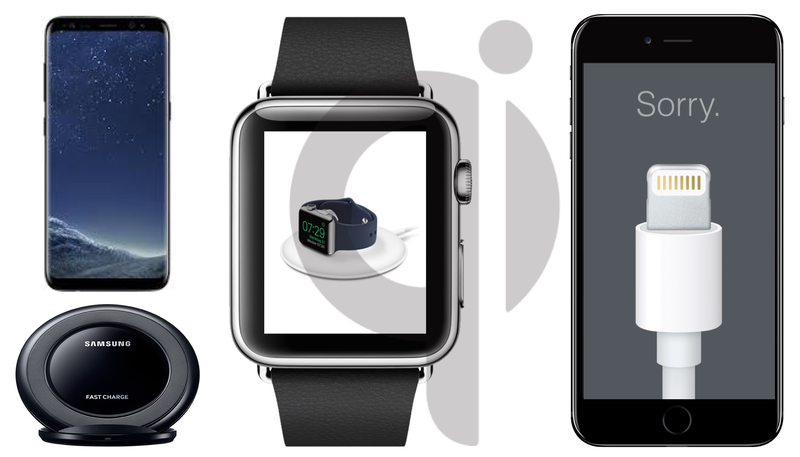 Please don’t give us somewhat like your boring, ugly-designed, and featureless standard charger we get for your  Watch. According to all announcements about your environmental initiatives we expect your Qi charging protocol to be fully compatible with other Qi chargers. Wired or wireless, please stay tuned. If nothing works dispatch smoke signals.